Satellite image of Storm Desmond centred off south-east Iceland (shown in outline). 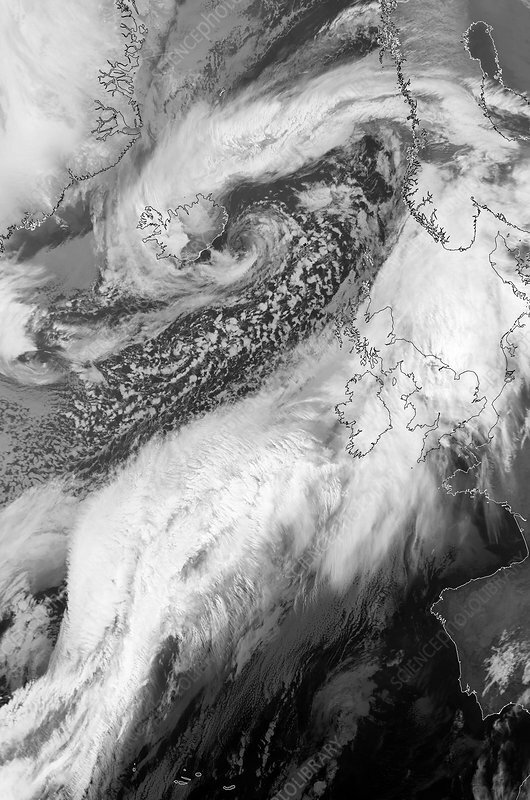 The storm's frontal cloud is extending across the UK to Scandinavia. Desmond was the fourth named storm of the 2015 season. It bought gales, with gusts of up to 130 kilometres an hour, and record-breaking rainfall to the north of England. Over six thousand homes were flooded and the storm caused over GBP400 million of damage. Image data obtained on 5th December 2015 with the AVHRR (Advanced Very High Resolution Radiometer) sensor on one of the polar orbiting satellite operated by the US National Oceanic and Atmospheric Administration (NOAA).